A medium sized shrub, Phebalium woombye comes in three forms, a pink flowering variety and a white form. The third form is a prostrate form with larger flowers than most. For a plant that has been in cultivation for many years it is surprisingly difficult to find for sale. The flowers are star shaped with yellow stames, the foliage is a deep green, oblong in shape and aromatic when brushed against or rubbed. This is a plant that is at its best in part shade, or light dappled shade. It does require a well drained soil and will benefit from a little mulch that will retain some moisture as well as a cool root run. 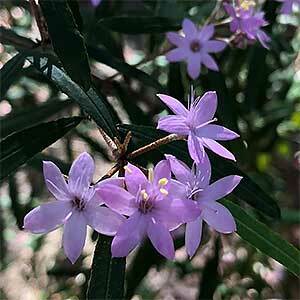 This is a plant that grows naturally in the coastal foothills form northern NSW in Queensland, however it is adaptable and will grow well as far south as Melbourne. Propagation is usually from cuttings of the new seasons growth. Also possible form seed however germination rates are poor. Height – To around 2 metres. Flowers – Pink or White depending on form.